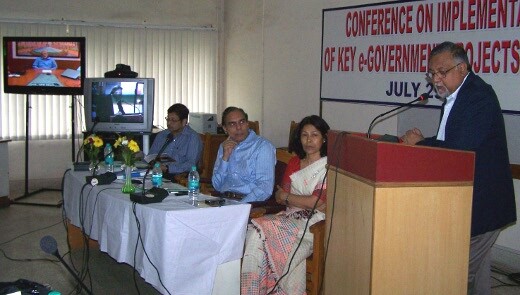 NIC Assam State Centre organized a one-day Conference on Implementation of key e-Governance projects in Assam on 29th July, 2010 at the Assam Administrative Staff College, Guwahati. The conference was attended by senior bureaucrats of Assam Government, senior-level NIC officials from New Delhi and Assam. Director General of NIC addressed the gathering through video conferencing from New Delhi. Sectoral presentations on important projects were given through video conferencing from New Delhi, Pune, Gandhinagar and Chennai, besides presentations at the conference venue. As part of the publicity campaign for the upcoming Commonwealth Games, Indian Railways started a train 'Commonwealth Express' to showcase the areas of progress in India. Information Technology was a major part of the exhibition in which NIC showcased the IT sector. The train went trough Assam with two major stops at Kamakhya in Guwahati on 19th and 20th July, 2010 and at Mariani in Jorhat on 22nd July, 2010. The NIC stalls were visited by over 12,000 visitors during the period. NIC Official of Assam took charge of the NIC exhibition during this period and showcased the major projects taken up in Assam. A large number of vistors visited the NIC stalls and appreciated the exhibition. Students participated in the IT Quiz and were awarded certificates to the winners. 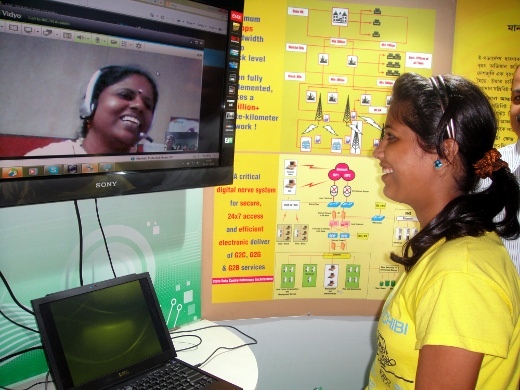 Video Conferencing was a major attraction in the exhibition.